California School Library Association (CSLA) - an organization of teacher librarians, classroom teachers, paraprofessionals, district and county coordinators of curriculum, media and technology, and others committed to enriching student learning by building a better future for school libraries. School Libraries Work! (Scholastic 2008) - Summarizes findings from a decade of empirical studies that cite the measurable impact school libraries and library media specialists have on student achievement. Standards & Guidelines for Strong School Libraries (2005) - Like other subject areas, Teacher Librarians teach standards too. In fact, 11% of the English Language Arts STAR test reflects these standards. LibraryScienceDegree.org - an unbiased and updated list of every school that offers a library science degree in the US. What can I do? Contact your local officials. 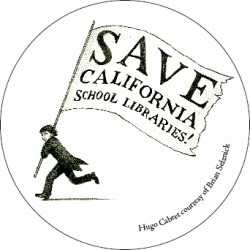 Join the California Campaign for Strong School Libraries! Click the image at left for more information.